The U.S. Youth Soccer organization is a nonprofit agency that uses the sport of soccer to ignite a youth's physical, emotional and mental growth. The American Youth Soccer Organization provides youth soccer programs in a fun, family environment. Both organizations have established similar set lengths of time for youth soccer games. In addition to the regular soccer games, there are also small-sided soccer rules providing for a smaller field and fewer players. 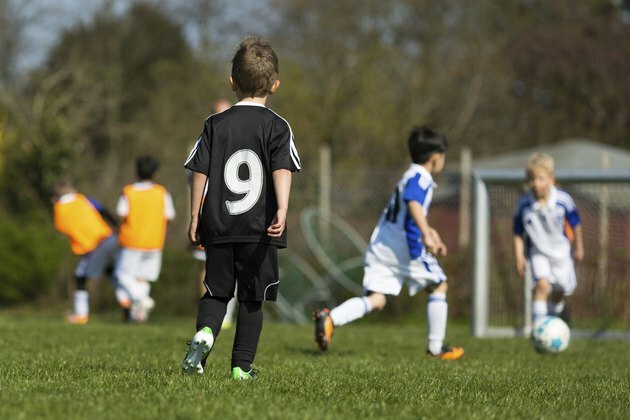 For youth younger than 6 years old, the AYSO recommends two 10-minute halves with a five- to 10-minute break between. US Youth Soccer uses quarter periods for youth younger than 6 and recommends four six-minute quarters. If the game is tied, no overtime is required. Both organizations allow a small-sided game, with a smaller field and fewer players. Game times are the same for the age 6 and under players, but the field is between 20 and 30 yards long and 15 to 25 yards wide. There are no goaltenders. For youth younger than 8 years old, AYSO uses two 20-minute halves with a five- to 10-minute halftime. US Youth Soccer uses four 12-minute quarters for less than 8 years of age. No overtime is needed if the game is tied at the end of the allotted time. Total game time is between 45 and 58 minutes. Small-side soccer is played on a smaller field, 25 to 35 yards long and 20 to 30 yards wide. The game is divided into four quarters of 12 minutes each. Like the under age 6 games, there are no goalies. For youth younger than 10 years of age, the AYSO and US Youth Soccer require two 25-minute halves. For youth younger than 12 years of age, the AYSO and the US Youth Soccer require two 30-minute halves. For overtime in an under 12 game the US Youth Soccer requires two 10-minute halves. Total game time is 55 to 60 minutes for younger than 10 and 60 to 90 minutes for younger than 12. The small-sided game field gets larger as the players get older, up to 45-by-60 yards for under 10 players and 55-by-80 yards for under 12 players. The game times are the same as regular games for each age group. The AYSO and the US Youth Soccer associations require two 35-minute halves for youth younger than 14 years of age. The amount of time allowed for half time is determined by the referees, between five and 10 minutes. If the game is tied, the US Youth Soccer uses two 10-minutes halves for the tie breaker. Total game time is between 75 and 90 minutes. For youth soccer games in the under 16 age group, the AYSO and the US Youth Soccer use two 40-minute halves. At the end of regular play, if the game is tied, the US Youth Soccer requires two 15-minute halves be played as a tie breaker. Total game time is between 85 and 120 minutes. During youth soccer games for ages, 17, 18 and 19, the AYSO and U.S. Youth Soccer require two 45-minute halves. According to US Youth Soccer rules, two 15-minute halves are added to the game if the score is tied at the end of regular play. Total game time is between 95 and 130 minutes.